Digital Nomad Retirement. The ability to travel the globe whilst earning a digital income on autopilot in the background from a laptop. tablet or smartphone. “I’m celebrating 21 years in this business. 21 years in which I have gone from starting in my spare room at home to banking over £80million. “And to think I almost didn’t go to that event! It meant getting time off work, travelling to the venue, booking a cheap hotel for overnight etc. Today I shudder at the thought that life could have been so very different for me if I’d not bothered to attend. I’d probably still be doing that corporate job. Or I would have been put out to graze, getting by on a meagre pension by now. That one decision – to attend the three day event at all costs… putting the hotel and travel on my credit card – was the best move I ever made. It totally changed my life – and the lives of family and friends who have benefitted too. (Not to mention the £millions that Andrew Reynolds has raised and donated, for charities in the UK and abroad. As a result of that decision to attend a three-day workshop on making money, it lead to Andrew leading the life of a digital nomad. 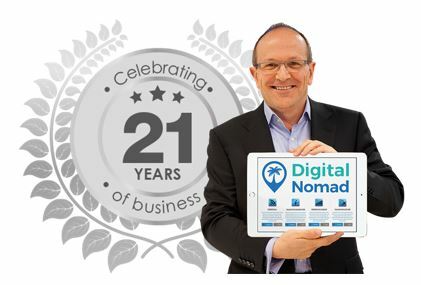 Travelling the globe with his laptop or tablet – running a business online on autopilot. I wish you all the success and happiness in your well-earned retirement. You have been an inspiration to many thousands of people, whose lives you have benefited massively. I’m about to follow up your wonderful Digital Nomad Retirement gift, and hope that I can get my somewhat dodgy 77-year-old grey matter to master it. It’s been a pleasure to have had many dealings with you over the years and hope you have a truly wonderful retirement. Hope your well, all the best on your retirement. 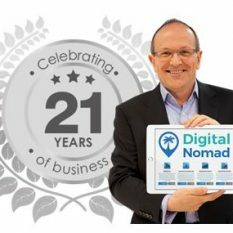 How can i get access to digital Nomad and Your last event recordings? I missed the event is there any recording and how can I get started. I can’t click on link it says no permission. Can you send me further details about the Business. Hi Andrew. Please may I have my login credentials for both the Digital Nomad package and the Event recordings? Thank you. I had a brilliant time at your event over the weekend and can’t wait to get started! When will we receive the sales copy and software? It was a great weekend and I wish Andrew Reynolds all the best in his retirement! Wish u all the best Andrew I have enjoyed the most wonderful 3 days at the excel arena everything was so amazing. Ive been following you wirh interest, since your Cash in Demand days. * If memory servers me, that was the time that you invited someone on to the stage to action one of tour systems live. What I would have given to have been that person. Because to that point, although I’d always followed you, I’d been sceptical. I.e its one in a million who succeeds. No “one in a million ” here. Everyone who donates and attends the event will get the full Ltd company package that I have promised including the Ltd company, readymade products, ready-written sales copy to use, software, traffic training etc. See you there! Congratulations, but I don’t believe that you can retire with all the charities you are helping. Well done. Thank you for your continuous letters of encouragement. As I write , I am totally angry with myself for not persisting since my first meeting in Brighton . I will be at this parting meeting. I pray that i encounter my light bulb moment. Albert – see you there for a great 3 days! I received your letter of invitation to the Digital Nomads summit in June and I absolutely cannot wait. I really want to put your amazing offer to work and make sure that it does change mine and my family’s lives for the better. Following in your footsteps of leaving my current job and living the life of my dreams, helping people in the process is the best way to live a life. Congratulations on your retirement. Thanks for all your help over the last few years. I’ve managed to make some money through the affiliate program for “copy this idea” project. I took my first steps into internet marketing following your ideas over 8 – 10 years ago and I’m so glad I did..I’m not very active at the moment but I proved to myself that I can earn without having a 9 – 5 job. The best thing about the internet lifestyle is the ability to turn it on and off at will. I have learnt a lot since the the very first cash on demand course but I do owe it to you as you have started me off with this wonderful journey. Well deserved retirement and maybe I will see you in June. Thanks for your kind words – and I look forward to shaking your hand at the end of June. Congratulations on 21 years and a well earned retirement. I am halfway through the cash on demand 3.0 course and am really enjoying it. I was wondering if your retirement is going to affect my subscription?? Your subscription won’t be affected – as my fulfilment company will still send out the course modules for the duration of the course. But you’ll definitely want to come along to the Digital Nomads Summit at the end of June as this will give you what you need to take the Cash On Demand business model forward – the Ltd company bought for you, the readymade products, the sales copy (which is the one thing that people tend to fall down on. I’ve got a top copywriter working on writing the sales copy right now – which I’ll hand you at the Summit…the software… the traffic training access…all of the things I’ve listed as a way of saying ‘thanks’ for your support in the past. This will help you ‘hit the ground running’ – starting the day after we meet at the Summit. See you there! Look forward to seeing you at the end of June. Yes I would be interested in running such a profitable venture with your guidance knowledge and expertise. I shall be there Andrew and I just finished reading ur amazing book copy this idea it’s so mind blowing I’m so so sad to hear that he retireing I enjoyed everysingle moment of ur teachings and I will be seeing u there on the 29th of next month. All the best in ur retirement Andrew and I still can’t believe that its been 21 years ago u started this amazing journey and thanks for helping me through the cash and demand scheme as well. Thanks – all the best. Great – see you there!